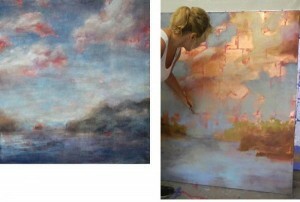 Nicole Etienne is in Ashland for a short time and is preparing paintings for her expositions in Los Angeles, London and St. Barthelemy in 2012. She will include use of copper metal leaves, antiqued glazing and application of oil paint with large brushes! The showcased techniques are the “secret” to her rich and moody skies of her land and water series. We would love for you to join us! There will also be information of 2012 classes in Ashland, London, and the South of France. Hidden down a peaceful Railroad District alley lies a destination workshop/showroom. The light-filled renovated carriage house is filled to the rafters with visual inspiration and grand completed canvases. At the easel is professional artist Suzanne Etienne, at work on a custom commission. A polite Boxer dog pads in from the lush gardens for a greeting. Tea is on and music fills the beautifully appointed space. Everywhere you turn is tempting inspiration. You’ll glimpse vibrant street scenes from Ireland to Paris, a huge Grizzly grinning over the fish grasped in its jaw, an old bicycle leaning against a building, blossoms spilling from its basket. The studio is open for browsing and consultation by appointment and also for First Friday Open Studios. Etienne is also available for commissions.